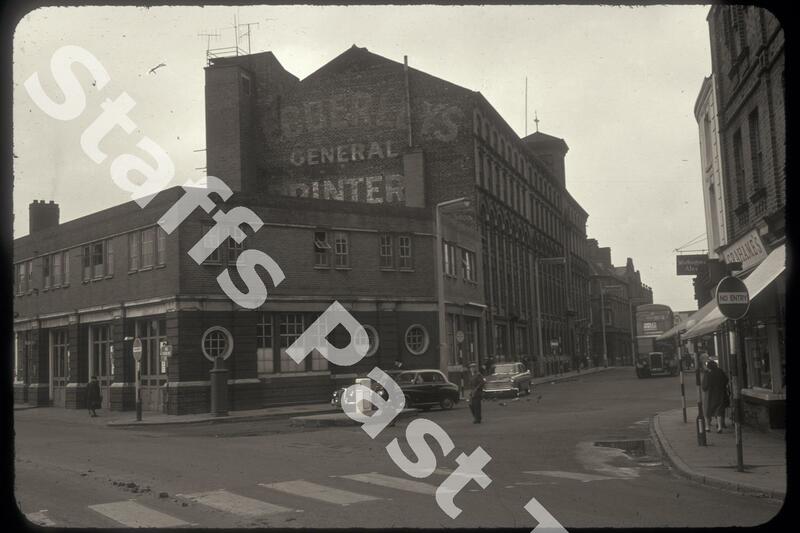 Description:In the foreground is Hanley Fire Station and behind the premises of Webberley Ltd, printers, stationers and booksellers. The camera is looking down Parliament Square towards Percy Street. The Fire Station stood on the corner of Old Hall Street and was opened in 1921. It replaced an earlier station in Stafford Street. This building was demolished in 1970, replaced by the new station on the Potteries Way. The site hs been cleared. Webberley's were founded in 1913 in Tontine Square and moved to the Free Trade Buildings in Percy Street in 1924. The building itself dates from the 1880s. The business closed in 2016. Parked in Percy Street is the Stoniers bus service from Hanley to Bentilee.